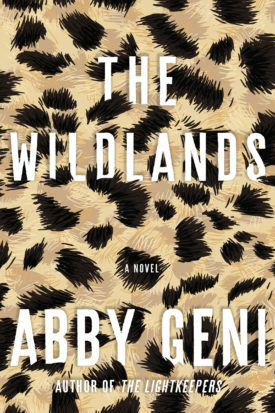 The following is from Abby Geni's novel, The Wildlands. After a Category 5 hurricane, the McCloud siblings find themselves orphaned. Three years later, their charismatic missing brother Tucker reappears and drafts his sister Cora into a mission to make war on civilization. Abby Geni is a graduate of the Iowa Writers' Workshop and the author of three novels. She has won the Barnes and Noble Discover Great New Writers Award and the Chicago Book Review Award. I never heard the siren. I slept through the rising wind and the tree branches wrenching loose and colliding with the roof. I did not catch the sound of the cows lowing in the back field or the horses stamping anxiously. I was taking a nap. It was late afternoon on a Saturday in spring, so many years ago. By the time my sister woke me, the sky had turned green. That was the first thing I noticed, blinking and yawning, still dewy with sleep. Darlene threw off my blankets. I was only six years old then, still young enough to be slung over my sister’s shoulder and carried down the hallway at a trot. Bouncing on her back, I glanced out the window and saw the Oklahoma sky soaked with a new color. Damp jade. Split pea soup. Moss on stone. Darlene set me down on the couch and dashed upstairs again. I sat dazed for a moment. There was turmoil both inside the house and out. My whole family seemed to be in motion, a babel of footsteps and voices. All the lights were lit. It was raining, but not in any way I recognized. The drizzle came in lashing, inconsistent bursts, tonguing the window, splattering a door, then subsiding into an eerie silence. My father hurried past me at a breathless jog, his belly bouncing. He was holding a box that clanked with each step as he lumbered down the stairs into the basement. I got to my feet and went to the window, pushing the curtains aside. The breeze was laden with flecks of white and brown—papers and leaves and trash. The wind seemed to be picking things up and putting them down again like a child selecting a toy to play with. I tried to gather my wits. From the upper floor, voices filtered down, high and shrill. Tucker and Jane were shouting. From what I could tell, they were agreeing with one another, albeit angrily. A mosaic of raindrops dusted the glass. I saw the big oak tree bow as though in prayer. A bird whizzed past the window, flying backward. I nearly laughed at the sight—the beak pointed in the wrong direction, neck extended, every muscle straining. It could not make the slightest bit of headway; it could not even turn itself the right way around. Its feathers were rumpled, sticking up at sharp angles, its beak agape. The breeze swept it rearward, borne away on the current like a twig in rapids. He pounded out the back door, slamming it hard enough to shake the house. Then there was stillness. For a moment, I could hear nothing but the wind. I laid a hand on the glass. The sky was darkening as though someone had spilled ink into the clouds. Our lawn chairs were piled in an untidy heap by the fence. The yard did not look like the place where I had played yesterday. It was strewn with plastic bags and dirty papers, other people’s refuse. Tree branches dotted the grass, and my toys were gone—no hula hoop, no Frisbee, no tennis racket. Shimmering veils of rain hid the barn and the cow paddock. Our land sprawled across several acres. I squinted through the drizzle, trying to find order in a jumble of droplets and debris. The trees were no help, swaying ominously, blocking my view, their trunks groaning from the exertion. In the distance, the cows were lying down—silvery shapes in the wet grass. This was worrisome. I knew a lot about cows; I had walked among them, patting their meaty necks, listening to their chewing, their tails swishing the flies away, their eyes tracking my every move. I had offered them bunches of grass, keeping my palm flat to avoid their massive teeth. Their breath was always milky and hot, their tongues as rough as sandpaper. They spent their days pacing the field, communicating with one another in bellows. They lay down only when things were bad—not enough water, too much heat, a bewildering storm. I could not see the rest of the animals. The horses were probably safe in the barn. We had three: an old gray stallion, a moody mare, and a pony with a bronze coat and a joyful temperament. Most afternoons the colt could be found cantering in the grass, kicking his legs high and twisting his thin torso into jaunty leaps, as though with a little effort he could undo the binds of gravity and gallop away on the wind. My brother was particularly good with the horses. Tucker had a way of whispering to them, coming close and stroking their flanks. They would grow still, ears cocked forward as though absorbing his words intently, nuzzling against him, their breath commingled with his. At that moment, Darlene bounded downstairs. She was flushed, and her bangs were disheveled, rising off her forehead like steam. She darted around the living room, collecting the photographs of our mother. There were half a dozen displayed in nice frames. On the mantel, Mama stood backlit against the sun in a field of flowers. On the coffee table, Mama sat astride our gray stallion, pointing at the camera and laughing. On the end table, Mama posed in an unknown forest with an unknown black dog at her side. Darlene piled all the picture frames in her arms. I opened my mouth to ask her a question, but she was already gone, heading for the basement. I turned back to the window. Thirty feet away, a lone calf darted into view, dashing out from behind a tree and disappearing into a clot of bushes. There were a few new calves among the herd; I wondered which one this might be. I wondered how the chickens were faring in their cramped coop. I wondered where our little goat—shy, skittish, with fur like pulled cotton—had found shelter. A hand fell on my nape. My brother was standing beside me. “The sky is green,” I said. Tucker knelt down, his eyes level with mine. 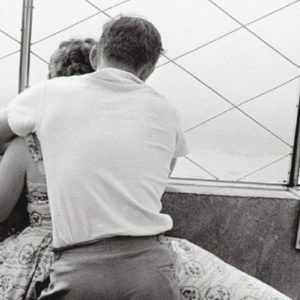 He was seventeen, wiry and muscular, every movement lush with intention and grace. His curly hair was tugged back in a ponytail. He put one hand on each of my shoulders. “Do you understand what’s happening?” he said. “We’re going there now,” he said. From The Wildlands. Used with permission of Counterpoint Press. Copyright © 2018 by Abby Geni.